2. In a medium bowl, whisk together flour, baking soda, salt, ginger, pumpkin pie spice and set aside. 3. In a large bowl, combine coconut oil and sugar. Beat with a hand mixer until smooth. 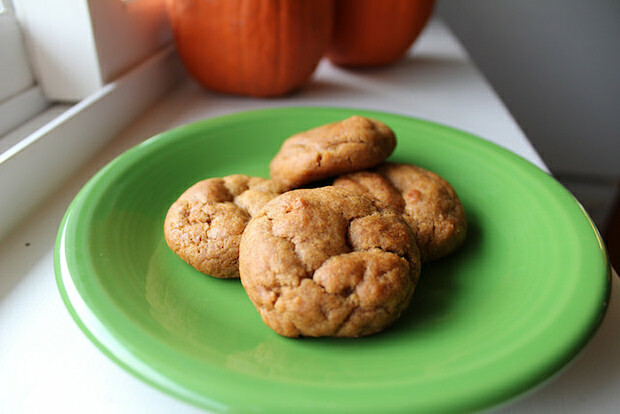 Add pumpkin, molasses, and vanilla extract and beat until all ingredients are combined. 4. Stir flour mixture into the wet ingredients until just blended. 5. Roll dough into tablespoon-sized balls and place two inches apart on a parchment-lined cookie sheet. Bake for 10-12 minutes, until cookies are set but still slightly soft. 6. Cool cookies on baking sheet for 2 minutes after removing from oven and transfer to a cooling rack. Notes: I don’t recommend using blackstrap molasses. The dough can be refrigerated for up to two days. Enter your email address to follow Allie's Life and receive notifications of new posts by email.